for August 16th are Sorrowful. Mary wants to form Christ in us. intercession of Mary our Mother. The interior gift of ourselves. intercedes as she did on Calvary. of sacrifice in the past. From Response in Christ by Fr. Edward J. Carter, S.J. The sacrifice which Christ offered for the redemption of the world was first and foremost an interior moral act. Christ's life possessed its great value because of His interior dispositions. His entire life was a constant gift of Himself in love to the Father and to mankind, and Calvary was the supreme expression of this gift. This gift of self was regulated by a perfect conformity to His Father's will. As we have said, man, because of his corporeal and social nature, has always desired to express the interior oblation of sacrifice in an external, ritual oblation. So it was with Christ. Unlike the dualists, who maintain that Christ's interior offering was sufficiently exteriorized during the passion itself, the unicists maintain that the only place where we can locate a ritual oblation is at the Last Supper. This ritual oblation cannot be found in any other phase of Christ's sacrifice – from the Garden to the Cross – despite the efforts of some to do so. Notice, too, that in the case of Christ's sacrifice, the ritual oblation of the Last Supper is of a victim-to-be-immolated rather than of a victim already immolated. Christ's ritual oblation at the Last Supper possessed a many-faceted signification. We will comment on several aspects. We begin by recalling the social implications of the ritual oblation. This social element is present in Christ's actions at the Supper. He told the Apostles to do what He was doing in commemoration of Him. This would assure that in the future the head and members of the Church would sacramentally renew Christ's redemptive, sacrificial act. In this manner the members of Christ's Body would not passively receive the graces of Christ's sacrifice, but rather would assimilate these graces by actively entering into Christ's act of atonement. Consequently, Christ's sacrifice, in its perennial, sacramental renewal down through the ages, was to be of a social, corporate nature. Closely related to this social aspect of Christ's actions were the covenant significations of the Last Supper ritual. This is brought out by observing the connection of Christ's actions with two of the chief types of Jewish sacrifices we have previously mentioned, the sacrifice of the pasch and that of covenant. In both of these the concept of sacrificial blood enters in. The Last Supper was a paschal meal, or at least had a paschal significance. The Jewish paschal meal commemorated the Jewish people's delivery from Egyptian slavery, which, in turn, symbolized their deliverance from sin. The enslaved Jews had been freed from Egyptian tyranny with the aid of the blood of the paschal lamb. For this blood, we recall, had exempted Jewish homes from the visit of the exterminating angel. How fitting, then, that at the paschal supper Christ instituted the eucharist in which His blood is sacramentally shed. He is the new paschal lamb whose blood frees us not from Egyptian slavery but from slavery to sin. The old pasch, a covenant communion between Yahweh and His chosen people whom He delivered from Egypt, gives way to the new pasch, the new covenant communion between God and His people. These ideas concerning covenant lead us to a consideration of the second type of Jewish sacrifice linked with Christ's actions at the Last Supper. We recall that in the sacrifice of the covenant Moses sprinkled sacrificial blood on both the altar representing Yahweh and the people. This blood, considered to be source of life, united Yahweh and His people in a union, a common life, or, in other words, a covenant. We understand, consequently, the deep significance of Christ's words at the Last Supper when He referred to His blood as being that of the new covenant. This is the blood which establishes between God and men a new union, a new covenant. At this point we also note the profound unity of Christ's sacrifice. We observe that priest and victim are one and the same. At the Last Supper, Christ is chiefly priest; on Calvary, He is chiefly victim. Yet He is always priest and victim. Christ does not perform the immolation. He rather endures it. However, this is sufficient since it is not necessary for the priest of the sacrifice to achieve the immolation himself. In the union of these last two elements of Christ's sacrifice, His immolation in death and the acceptance of His sacrifice through the Resurrection and Ascension, lies the essence of Christ's redemptive act – of course, in saying this we presuppose the first element of Christ's sacrifice, His interior disposition or oblation; this is the essential element. This union of Christ's death and Resurrection is called His paschal mystery, His passover. In what did this passover or transition consist? In our initial chapter we briefly described this passover of Christ. We will now expand to some extent upon this basic reality of Christ's life. Consequently, we have observed, in terms of sacrificial elements, the most intimate union which exists between Christ's death and Resurrection. They are inseparable, and lie at the heart of the total mystery of Christ. This paschal mystery is central, therefore, to the liturgy and to the whole Christian life. The cycle of sacrifice is strikingly completed by God graciously extending an invitation to partake of the offered victim. This element of sacrifice is miraculously fulfilled in Christ's oblation. By the words of consecration the bread and wine become Christ. In this manner Christ gives Himself to His disciples at the Last Supper. We will further develop these ideas of eucharistic communion in our consideration of the Mass. We hereby complete the consideration of the elements of Christ's sacrifice. According to the unicists there was but one sacrifice of Christ. The Last Supper, death and Resurrection each contributed essential elements. This one sacrifice of Christ endures in its efficacy for all time. In itself it is not to be repeated. Its sacramental renewal, however, is repeated daily on our altars in the Mass. We should always unite the concepts of the Mass as sacrifice and the Mass as meal by realizing that the eucharistic meal is an integral part of the sacrifice. It is its conclusion. We should also be aware that the Mass is a covenant sacrifice. It is the sacramental renewal of Christ's covenant sacrifice. The Mass is the central act of our covenant life in Christ, and therefore it embraces the four great dimensions of covenant love. In Christ, by the action of the Holy Spirit, we open ourselves in a special manner during the eucharistic liturgy to the Father's love and we respond to that love. In Christ and His Spirit we also pledge ourselves at Mass to go out in a deeper love to the members of the People of God and to all men. We also commit ourselves anew to be open in receiving the love of others. According to these various perspectives, the Mass above all is an action of love. The chief priest and victim of the Mass is the same as the priest and victim of the Last Supper and Calvary, Christ Himself. Christ makes this interior offering of Himself in the Mass for the same ends as were present in His own unique sacrifice – adoration, thanksgiving, petition and satisfaction. However, Christ is not the only priest at the Mass as He was at the Last Supper and upon Calvary. All the members of the Mystical Body are priests along with Christ. To be sure, there is a difference between the hierarchical priesthood of bishops and priests and the universal priesthood of the faithful. This difference is one of essence and not merely degree. The point we wish to stress, however, is that the universal priesthood is a real participation in Christ's priesthood given through the sacraments of baptism and confirmation. This concept of the priesthood of all the Church's members is being stressed today in a special manner.18 Jungmann, the outstanding liturgical theologian, gives us reasons why this concept of universal priesthood became relatively obscure for so many years. He states that the concept of the Mass as the Church's sacrifice faded into the background as a result of the Reformation. The Reformers maintained that there was only one sacrifice, the one which Christ offered upon Calvary. To counteract this heresy the Council of Trent and the theology consequent to it had to clarify that the Mass is a true sacrifice, but not an absolutely independent one. It is a sacrifice relative to the absolute one of Calvary and a representation of it. It was emphasized that the priest of Calvary is also the chief priest of the Mass. Because of such doctrinal controversies, the concept that Christ offers the Mass was alone considered important. The concept that the Mass is also the sacrifice of the Church practically disappeared. Finally, Jungmann notes that today we are returning to the balanced view which meaningfully recognizes that the Mass is not only the sacrifice of Christ, but also that of the Church.19 This stress on the Church's part in the Mass is logically connected with the contemporary emphasis on the priesthood of all the members of the People of God. As Christ is not the only priest of the Mass, neither is He the only victim. Again, all the members of the Church are victims along with Christ. Various Church documents attest to this. For instance, Pope Paul VI officially calls attention to this: "It is a pleasure to add another point particularly conducive to shed light on the mystery of the Church, that it is the whole Church which, in union with Christ functioning as Priest and Victim, offers the Sacrifice of the Mass and is offered in it. "20 Therefore, the members of the People of God, united as priests to Christ the high priest, offer a combined victim to the Father: Christ and themselves. Such then in all its deep meaning and beauty is the first sacrificial element of the Mass. Just as Christ's interior offering of Himself was externalized in a ritual oblation at the Last Supper, so is there an external, liturgical rite of the Mass. The importance of this many-faceted exteriorization is brought out by Vatican II's Constitution on the Liturgy. As also previously observed, the external rite is likewise according to man's bodily nature. In the case of the Mass (and the sacraments also) we observe that the very validity of the sacrifice depends on having the proper materials for the offering – bread and wine – and on the use of the proper form of consecration. The external, the ritual, the sensible, are indeed indispensable. In all this we note the great law of incarnation. The Incarnation established a set pattern for the redemption of the world, redemption taken both objectively and subjectively. Christ redeemed the world through His sacred humanity. This humanity is, then, the gateway to the divinity, to eternal life. At various times in the history of Christian spirituality, the Church has been plagued with an exaggerated spiritualism rising out of various sources. Such a spiritualism, looking upon material things as more of a hindrance than a help, is foreign to the true Christian spirit. A true theology of the Incarnation, a theology which the Church so well concretizes in her liturgy, can lead to no other conclusion. It is no accident that a meaningful incarnation spirituality is developing concomitant with the liturgical renewal. Although we would not want to say that the incarnational element outweighs the transcendent element in the Church's portrayal of the Christian life, yet she is leading the faithful of all vocations to a deeper incarnationalism. The Church is accomplishing this through a variety of ways. She is achieving this incarnationalism, for instance, through the great social encyclicals, through the documents of Vatican II, and, in reference to our present topic, through a revived liturgy. There is a deep significance, and a rich world of thought connected with the second sacrificial element of the Mass: the ritual oblation which incarnates the interior oblation. However, as we have said, Christ is not the only victim of the eucharistic sacrifice. The members of His Body, the Church, are also victims along with Christ. Those members must also be in a state of victimhood. As with Christ, they cannot undergo a bloody immolation. Their immolation must also be a mystical one. How is this accomplished? We can look to two passages of the encyclical Mediator Dei for thoughts on such a mystical immolation. In one passage we read that pride, anger, impurity and all evil desires are to be mystically slain. As the Christian stands before the altar, he should bring with him a transformed heart, purified as much as possible from all trace of sin.27 Positively considered, such a transformation means that the Christian is striving to grow in the supernatural life by all possible means, so as to present himself always as an acceptable victim to the heavenly Father. Summarily, then, we become victims with Christ by lovingly conforming our wills to the Father's will in all things. Such conformity was the essence of Christ's sacrifice, of His victimhood, and of His immolation. A similar conformity must be in the victimhood and the immolation of Christ's members. This mystical immolation is a lifelong process. The ideal is that each Mass participated in by the Christian should mark a growth in his victimhood. The true Christian desires to die more and more to all which is not according to God's will so that he may become an ever more perfect victim with Christ. It has been observed that if sacrifice is to have its desired effect, it must be accepted by God. That the Father always accepts the eucharistic sacrifice is certain. For the principal priest and victim is Christ Himself, always supremely acceptable to the Father. As for the subordinate priests and victims, they are, taken together, the People of God, the Church herself. There is always an acceptance on the Father's part even as regards this subordinate priesthood and victimhood of the Mass. For even though the Mass may be offered through the sacrilegious hands of an unworthy priest, there is always a basic holiness in the Church pleasing to God. Because of such holiness the Father always accepts the Church's sacrificial offering, for the Mass is the sacrifice of the whole Church, and cannot be fundamentally vitiated by the unworthiness of any particular member or members, even if that member be the officiating priest. Having considered in successive sections the immolation and acceptance elements of the Mass, we should consider the vital link between these two. For just as the two are inseparably connected in Christ's sacrifice, so are they also united in the Church's sacrifice of the Mass. In Christ we equated the immolation of His sacrifice with His passion-death, and the acceptance element with His Resurrection. Uniting these two mysteries of death-resurrection, we spoke of Christ's paschal mystery. We have seen that this mystery had been prefigured by the Jewish pasch and exodus, component parts of the Jewish people's transition to a new and more perfect life. In the case of Christ, we considered His pasch – His passover – to be a transition from the limitations of His mortal life to the state of resurrected glory. We speak of Christ's mortal humanity as having exercised limitations upon Him in this sense, that, although He Himself was completely free from sin, He had exposed Himself to the conditions of a sin-laden world through His human nature. In His death-resurrection He changed all this as He conquered sin, as He redeemed us, as He passed to the state of glory with His Father. What happened in Christ also occurs in His Mystical Body, the Church. The Church and Her members experience their own transition from death to resurrection. The entire Church and the individual Christian express, through the Mass, a willingness to grow in the participation in Christ's death. The Father accepts this willingness and gives an increase in the grace-life, a greater share in Christ's Resurrection. This process happened within a short span of time in Christ's life. In the life of the Church it continually takes place until Christ's second coming. The Church, with her grace-life of holiness, has already partially achieved her resurrection, but not completely, even though she continues to grow in grace. St. Paul bears witness to this: ". . . but all of us who possess the first-fruits of the Spirit, we too groan inwardly as we wait for our bodies to be set free." (Rm 8:23). The cycle of the eucharistic sacrifice is completed as the priest and faithful partake of Christ the paschal lamb. The People of God have given Christ to the Father. Now the Father gives Christ to the Church's members in the eucharistic meal. 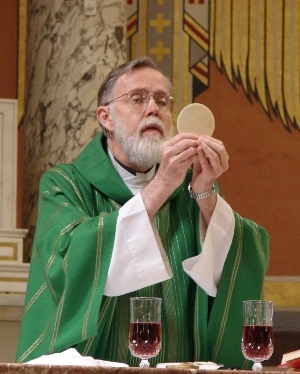 Although the priest alone must communicate to assure the integrity of the sacrifice, it is highly desirable, of course, that all present partake of the eucharist. In the sacrifices of old, the victim of the sacrificial banquet was considered in some sense divine by the fact that it had been offered to the divinity. In the sacrifice of the new covenant we receive divinity itself through the sacred humanity. With such a marvelous conclusion to the eucharistic sacrifice, the fruits of Christ's sacrifice of Calvary are continually experienced. Through the sharing of the one paschal lamb, the Christian assembly has thus been vividly reminded of their oneness in Christ. Yet this is a oneness in plurality. For each Christian is a member of the one Body of Christ in his own unique way. He has been called upon to assimilate Christ according to his own personality, vocation and graces. Consequently, just as the members of the People of God are reminded of their unity at Mass, so are they made aware of their own uniqueness as they depart from the eucharistic assembly, each carrying Christ to his own particular environment according to his own individual personality. We have considered the Church's eucharistic sharing in the mystery of Christ according to a sacrificial structure. With the general structure of the Mass established, we will now enlarge upon the concept of the participation of the individual. God has created man a social being. This fact has relevance as regards man's salvation and perfection. Man does not go to God alone, but rather is saved and perfected with and through others. This is evident in the study of salvation history as one observes God communicating Himself to man in the framework of community. As we have seen, this social dimension is also readily evident in the liturgy. As we now discuss the individual's participation in the liturgy, we in no way intend to underestimate the communal aspect of the eucharistic sacrifice. We constantly presuppose it and its importance. Liturgy as communal is the indispensable framework and background for any discussion of the individual's liturgical participation. Granted all this, it is still useful and necessary to speak of the individual's participation in the Mass.33 Ultimately it is the individual as individual who accepts or rejects God's offer of salvation and sanctification. Therefore, to speak of the individual's response to God in the liturgy is highly significant. Despite all the communal helps the individual receives in the liturgy, despite the fact that the individual must always be deeply aware that he is a member of the community, the People of God, it is still true to say that it is within the depths of his own mysterious, individual personality that the Christian either becomes a mature Christian through the liturgy or fails to do so. With such preliminary ideas established, let us now consider the Christian and his role in the Mass. Once again the reader is reminded that through baptism the Christian becomes incorporated into Christ and His Church. Confirmation perfects this incorporation. Although baptism incorporates us primarily into Christ's death and Resurrection, we again stress that it also unites us with Christ in all His mysteries. This is so because all Christ's mysteries are essentially one mystery, for none of them stands separately by itself. Consequently, one cannot be initiated into Christ's paschal mystery without simultaneously being incorporated into all of His mysteries. The fact that all of Christ's various mysteries are contained in the total mystery of Christ enables the Christian to encounter the entire Christ in the liturgy. Mention of this fact brings us to our next point. In baptism the Christian first encounters and relives the mystery of Christ. He thereby receives a new life. But this life must be nourished. The Christian must constantly re-encounter the mystery of Christ, and this he does chiefly through the eucharistic liturgy. Here the Christian is daily privileged to encounter Christ in the most intimate fashion. 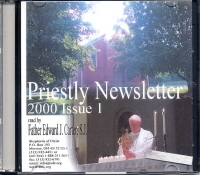 Here above all he exercises his priesthood and consequently grows in supernatural vitality. We use the word exercise purposely, since the liturgy is primarily an action, an exercise of the priestly office of Christ. Since the baptized Christian is sacramentally participating in the mystery of Christ at the Mass, his priestly act must be modeled after that of Christ's. This is true because the life of grace flowing out of the seals of baptism and confirmation is structured according to certain modalities or characteristics based on the life of Christ. This truth was developed at some length in the previous chapter. There we stated that Christ, the head of the Mystical Body, has determined, through His own life of sanctifying grace, the general lines of development according to which His members' lives of grace grow and mature. Therefore it is evident that the whole of the Christian's life must be orientated to the Mass and be centered about it; for in Christ we see His entire life centered around His priestly act of Calvary. This is true because His interior sacrificial disposition, the essence of His priestly act, permeated everything in His life. Yet the Mass also looks to the future of the Christian. By his participation in the Mass he receives grace to assimilate in a more perfect manner the mystery of Christ. Ideally, each Mass participated in by the Christian should mean that he leaves the eucharistic assembly with a greater Christ-likeness. Thus he takes up his daily life as a more fervent Christ-bearer. As the Christian lives out the Mass, he is consequently daily laboring with Christ in furthering the work of the subjective redemption. This is so because Christ's sacrifice was a redemptive act, and the Church's reliving of this act in the Mass is also redemptive. In this regard we must remember that the entire universe – not merely man – has been redeemed. The nonrational and rational world alike await the furthering of the redemption. St. Paul tells us: "From the beginning till now the entire creation, as we know, has been groaning in one great act of giving birth; and not only creation, but all of us who possess the first-fruits of the Spirit, we too groan inwardly as we wait for our bodies to be set free." (Rm 8:22-23). How does the Christian help Christ redeem the world? (Henceforth the term "world" is to be understood as including both rational and nonrational creation.) As previously stated, the Christian helps Christ redeem the world by reliving Christ's mysteries. The same "events" or mysteries which accomplished the objective redemption further the subjective redemption also. Since at the heart of Christ's mysteries are His death and Resurrection, it is especially these that the Christian must relive. As the Christian dies mystically with Christ through loving conformity with the Father's will, he rises with Christ to an ever greater share in the Resurrection, in the newness of life, in the life of grace. As the Christian in this manner relives the paschal mystery of Christ, he is accomplishing not only his own redemption, but he is also, in a mysterious yet real manner, helping Christ redeem the world. Although Christ's life was summed up in death-resurrection, it also included various other "events" or mysteries. Each of these in its own manner contributed to the redemption. So it is with the Christian's life. His participation in Christ's death-resurrection must be "broken down" into the other mysteries of Christ's life. Before we give examples of how the Christian can relive these saving events of Christ's life, it is well that we first distinguish the two different levels on which the Christian assimilates the mystery of Christ. Christ, through His death and Resurrection, has transformed us. This transformation is a "new creation," a new life of grace. Through our baptism we are initiated into this life and consequently we exist as new creatures. As long as we possess the life of sanctifying grace, which is our share in the mystery of Christ, we are living according to this new existence whether or not this life here and now incarnates itself in a concrete, supernatural act. In this sense the life of grace, the "new creation," is fundamental, radical and transcendent, a share in the transcendent holiness or mystery of God Himself. However, God expects that our life of transcendent holiness incarnate itself in concrete supernatural acts. It is in this respect that we speak of reliving the various mysteries of Christ through specific supernatural attitudes and acts. This may also be called imitation of Christ, but with a certain precaution, namely, that the imitation in question is to be considered primarily as interior rather than exterior. By this we mean that although the Christian can to a certain extent imitate Christ according to what was His external mode of conduct, it is primarily through adopting the mind of Christ – His interior dispositions – that the Christian puts on Christ. With this said we now offer suggestions as to how the Christian relives the mysteries of Christ whose presence and transforming influences have been encountered in the eucharistic liturgy. Christ did not lead only a hidden life, but a public life also. All vocations within the Church are likewise called upon to reproduce this part of Christ's life in some manner. One aspect of Christ's public life that should be common to all Christian vocations is the selflessness, the constant concern and love for others which Christ constantly and vividly displayed. This concern for others cost Christ much in fatigue of body and mind. Nevertheless, He continuously gave Himself completely to others. St. Paul sums up the redemptive work of Christ under the mysteries of death-resurrection.38 These are the principal mysteries which the Christian must assimilate from the eucharistic liturgy and reproduce in his own life. More and more the Christian spiritual life is being considered as a process of death-resurrection. It is obvious why this is so, for if Christ's entire life was summed up in His death-resurrection, so also is that of His members. Christ's death and Resurrection are so closely united that they are two facets of one mystery rather than two separate mysteries.39 It is likewise with the Christian. The death aspect of his supernatural life is intimately connected with his life of resurrection, and in various ways. For instance, his very life of grace is his life of resurrection, but his continual growth in spiritual death – death to selfwill in all its numerous manifestations – is achieved through grace. Consequently, the Christian's life of resurrection always accompanies his life of death. We also see the two connected more obviously in the sense that a growth in the death element always results in a growth in the resurrection element. The daily life of the Christian, then, is a combination and antithesis of death-resurrection. As he gives himself in love to the Father's will, manifested to him in so many ways, the Christian is achieving both death and resurrection. Christ's ultimate goal, as man, was His Resurrection. Resurrection, a greater share in the divine life through grace, is also the goal of the Christian. These few remarks give examples of how each member of the People of God is called upon to relive Christ's entire life as centered in death-resurrection. More could be said. But we think our remarks have sufficed to indicate how the Christian is to live out these various mysteries of Christ. Moreover, let it be recalled that all the mysteries ultimately make up the one mystery of Christ. What we have said thus far applies in general to all vocations. But since there are different vocations within the Church, we must also say that each of these projects Christ in a somewhat different manner. Each Christian must study how in particular he is called to put on Christ. Essentially, of course, all put on Christ in the same manner. Yet there are accidental differences according to the vocation, work and individuals involved. For instance, the lay person, in general, is called to a deeper involvement in temporal affairs than is the religious. Each member of Christ, according to his particular vocation, work and personality, has something special to take away from the Mass.40 Each Christian, as he lives out the mystery of Christ, projects Christ to the world in his own way. Each Christian, as he himself grows in Christ-likeness, is also helping Christ to redeem the world in a manner commensurate with his total Christian person. For holiness is necessarily apostolic whether the Christian at any particular time is engaged in an external apostolate or not. 13. Bernard Cooke, "Synoptic Presentation of the Eucharist as Covenant Sacrifice" in Theological Studies, Vol. 21 (1960), p. 12. 14. Schillebeeckx, Op. cit., pp. 21-22. 15. Durrwell, Op. cit., pp. 68-69. This "acceptance" element of Christ's sacrifice is an extremely important one, a fact being shown through contemporary scriptural, theological and liturgical studies. Two outstanding works which treat of the role of Christ's Resurrection in God's redemptive plan are F. X. Durrwell's The Resurrection and L. Cerfaux's Christ in the Theology of St. Paul. 16. S. Lyonnet, "La valeur sotériologique de la résurrection du Christ selon saint Paul" in Gregorianum, Vol. 39 (1958), pp. 312-313. Translation taken from Theology Digest, Vol. 8 (1960), p. 92. 17. J. Jungmann, "Eucharistic Piety" in Worship, Vol. 35 (1961), p. 416. 18. Cf. Second Vatican Council, Constitution on the Liturgy, No. 48, and Constitution on the Church, No. 10. 19. Cf. Jungmann, Op. cit., p. 417. 20. 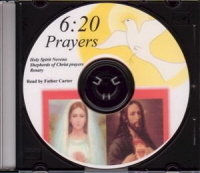 Paul VI, Mysterium Fidei, N.C.W.C. edition, Paragraph 31. 21. Second Vatican Council, Constitution on the Liturgy, No. 14. 22. Cf. Pierre Teilhard de Chardin, The Divine Milieu (New York: Harper Torchbooks, 1965), p. 123. Cf. also Christopher Mooney's commentary, "The Body of Christ in the Writings of Teilhard de Chardin" in Theological Studies, Vol. 25 (1964), p. 607. 23. From a lecture of Teilhard de Chardin given in 1930, cited in Mooney, Loc. cit. 24. Pius XII, Mediator Dei, N.C.W.C. edition, Paragraph 34. 25. J. Jungmann, Pastoral Liturgy (New York: Herder & Herder, 1962), p. 284. 26. Durrwell, Op. cit., pp. 324-325. 27. Cf. Mediator Dei, Paragraph 100. 28. Cf. Ibid., Paragraph 81. 29. J. Jungmann, The Mass of the Roman Rite (New York: Benziger, 1959), p. 146. 31. Constitution on the Church, No. 7. 32. Dietrich von Hildebrand, Liturgy and Personality (Baltimore: Helicon, 1960), p. 33. 33. Cf. Karl Rahner, Nature and Grace (New York: Sheed & Ward, 1964), pp. 23f. 34. Cf. Jungmann, "Eucharistic Piety" in Worship, Vol. 35 (1961), p. 419. 35. F. X. Durrwell, In the Redeeming Christ (New York: Sheed & Ward, 1963), p. 63. 36. Karl Rahner, Spiritual Exercises (New York: Herder & Herder, 1965), p. 160. 37. Schillebeeckx, Op. cit., p. 209. 39. Durrwell, The Resurrection, p. 48. 40. Cf. Karl Rahner, The Christian Commitment (New York: Sheed & Ward, 1963), p. 168. 42. For a current treatment of the varied richness of the Eucharist, cf. J. Wicks, "The Movement of Eucharistic Theology" in Chicago Studies, Vol. 10 (1971), pp. 267-284.